The revolutionary Facette® Shades combine all of the practical functionality of traditional Venetian blinds with the elegance of soft fabrics. 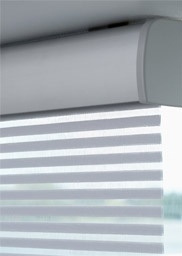 The latest innovative new design from Luxaflex®, Facette® Shades use a patented 3-D Trevira CS fabric that allows you to enjoy the exact amount of light or privacy you wish. Ultra-thin in profile with a beautiful light filtering effect, Facette Shades are available in 12 gently modern neutral colour tones. Sliding the opaque and translucent sections past one another allow you to choose the perfect balance of privacy and light at any moment of the day. Available in three vane widths and a range of contemporary and diverse colours - and even in up-to-date trend tones - Facette® Shades are designed to blend in harmoniously with your style and furnishings.